T-180 Pure Finish - This stands for thread count. The thread count is the number of horizontal and vertical threads in one square inch of fabric. The higher the thread count the softer the pillowcase will feel. 50% Cotton - 50% Polyester - or similiar blend based on our availability from our manufacturer. These pillowcases are commonly purchased by motels, camps, prisons, nursing homes, hospitals, and other types of facilities. These are institutional quality pillowcases. These are not recommended for screen printing. We suggest you purchase 100% cotton for screen printing. Some people also buy these for craft projects. Some people do buy our pillowcases to screen print or heat press, HOWEVER, they are manufactured with institutional use in mind. Keep this in mind when buying. Also a small percentage of the pillowcases might not meet "some" of the screen printers quality if perfection in each pillowcase is examined. If you buy for screen printing always assume 1% to 2% might not meet your needs and buy extra for your project. We do not provide credit for pillowcases used for screen printing if minor errors in quality are present. 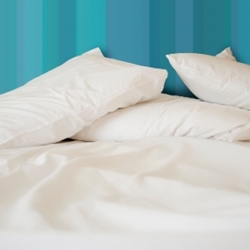 If the pillowcase can still be used on a pillow it is considered fine by our standards. If you want to purchase high thread count pillowcases you might consider stopping in at your local linen/bedding department store. © Pillowcase.NET 2019. All Rights Reserved.